For over 30 years, The Fellowship has worked tirelessly to help desperate Jews in Israel and around the world. 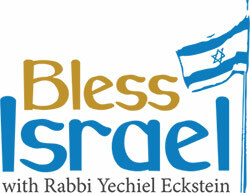 With Bless Israel, your listeners will learn how they can help Holocaust survivors, orphans, poor families and elderly, victims of terror and war, and those who are persecuted and oppressed. INTRUCTIONS: Click the tracks listed in the player below to hear the samples.